SCOPE: Conversion of existing 150,000 sq. ft. office building plus addition of two new warehouse buildings at 50,000 square feet each. Two new 50,000 sf pre-engineered warehouses were designed to flank an existing 150,000 sf corporate office building that was converted into a luxury fashion logistics headquarters for Stellae International. The new warehouses, clad with MBCI metal wall panels and punctured with bands of polycarbonate sheets allow diffused light into the 33' high spaces. The angled and cantilevered front facades provide a canopy above the recessed translucent walls, while framing them with red ribboning panels that further accentuate the entry facades which glow at night creating a dramatic presence on this nearly 13 acre site. Stellae International Inc., is a luxury goods and fashion logistics company based in Melville, NY. whose clients include major European and American fashion brands. The client’s sense of style and enthusiasm towards design and architecture as well as their hands on approach to every aspect of the project created a collaborative approach throughout the process. The existing central structure was converted to warehouse spaces, production spaces, administrative offices, dining halls and lounge areas. The entire complex, which is located on a 12.85 acre site, is connected via breezeways and courtyards that provide natural light and air to the warehouses and office space. Bold accent colors were incorporated to create different zones within the existing building. Andrew Davidson & Group Inc., a successful risk management company, hired I-Beam Design to create offices for their expanding business on a 7,000 square foot floor in the historic Bayard-Condict building designed by renowned architect and pioneer of the skyscraper, Louis Sullivan. Andrew Davidson & Group's desire for a comfortable, non-hierarchical and inspiring space for their staff to communicate with each other and clients provided the impetuous for the design. Upon entering the space one sees the circular conference room, a spaceship-like centerpiece that floats in the middle of the open plan layout of distinguished Herman Miller workstations. 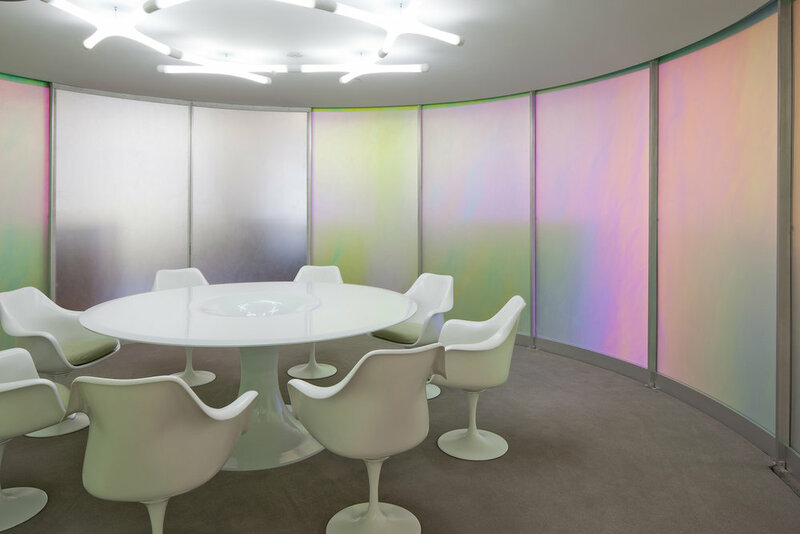 The conference room is made of dichroic acrylic panels that change color and opacity depending on the position of the viewer relative to the room. This creates a dramatic effect that is soothing from inside and engaging from the outside. The contemporary design is carried throughout the glass enclosed trading room and the communal dining area which features Saarinen's futuristic Tulip series of furniture and a variety of spherical lights suspended above like a mini solar system. In keeping with the flexible work atmosphere established by the client, the reception desk is designed to rotate around one of Louis Sullivan's perfectly round columns. The desk's position is adjustable and can be relocated to another column in the space to accommodate future adjustments to the spatial configuration. Similarly, an overhead grid of raceways and power points allows for workstations to be added or removed as necessary without sacrificing design integrity. 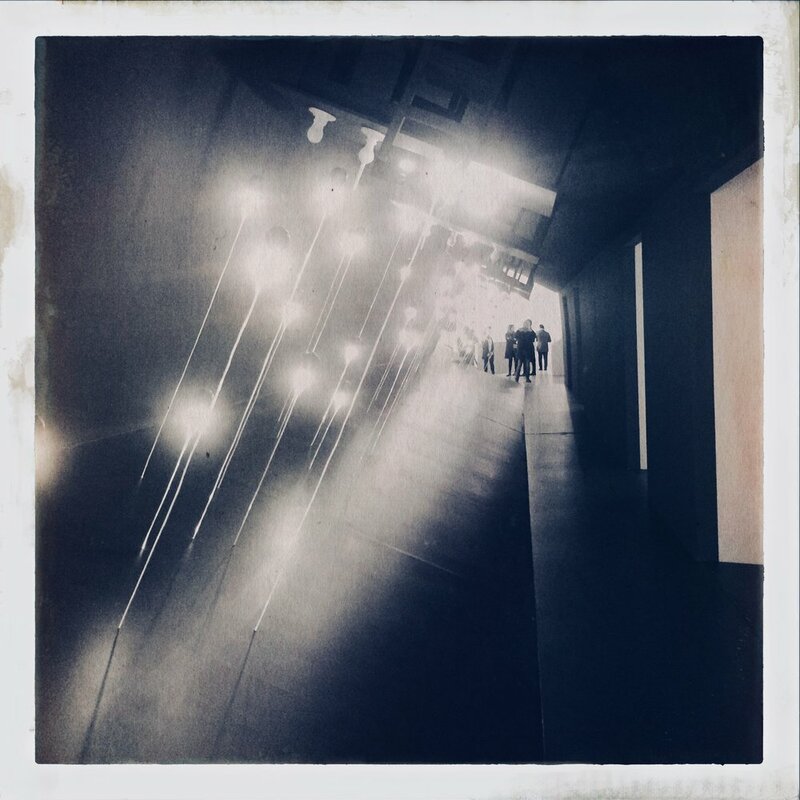 The soft ultra modern x-shaped light fixtures that appear to levitate overhead help define the work communities below and are also easily relocated, making the whole layout flexible and adaptable to future growth. The Reverse Room has been exhibited in Milan, New York, London and opening in Paris at the Pompidou Center and in Shanghai in fall of 2018. To accommodate the doubling of staff and tripling of space needs for Southern Telecom, a leading manufacturer of high quality electronics and consumer products, I-Beam Design was engaged to reconfigure and renovate an industrial building along the Brooklyn waterfront into a pre-eminent corporate headquarters. Inspired by Southern Telecom’s vision for access to high-design, convenience and efficiency for everyone through technology, I-Beam Design has created a clean, elegant working environment based on programmatic sequence, access to natural light and air and the specific needs of the various divisions to optimize joy, collaboration and functionality in the workplace. I-Beam considered the user’s experience, the brand’s image and the client’s budget and schedule constraints in making a project that could be designed and built quickly and efficiently. The objective of this project is to create a flexible, versatile and unobtrusive system for the presentation of diverse clothing collections within a seamless dream-like environment that does not compete with the clothes but rather enables them to float freely within the space. Gokaldas Images is India's largest integrated clothing corporation and garment exporter with a franchise of retail outlets in India, their own brand names and six independent product manufacturing divisions. Gokaldas Images has produced garments for Tommy Jeans, Calvin Klein, Polo, DKNY, Galaries Lafayette, Liz Claiborne and Armani. Their New York headquarters serves as a showroom for Gokaldas' various manufacturing divisions as well as a launch site for their new line of contemporary womenswear, "Ozia". 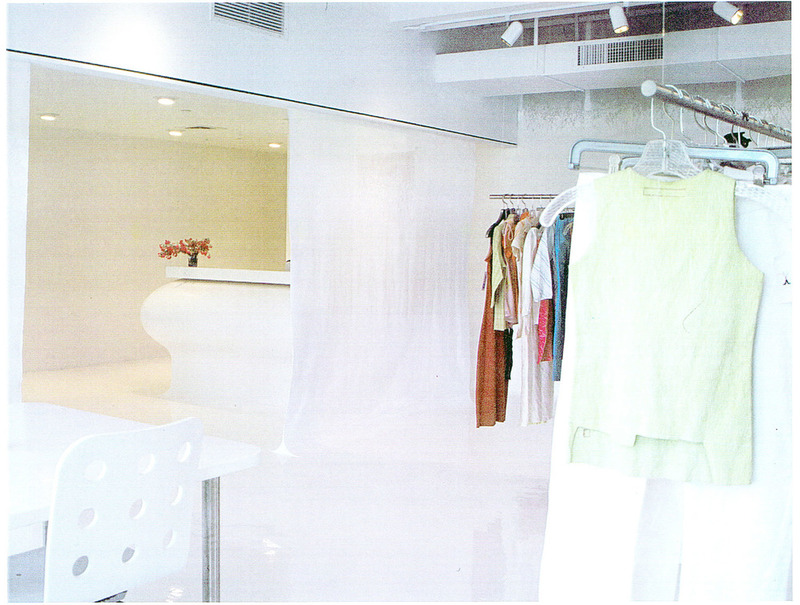 The floors, walls, screens and furniture of the showroom are poured in a continuous flow of white epoxy resin in order to create the ultimate sensation of bliss and buoyancy while viewing the garments. Despite the quantity and diversity of garments presented, the purity of this liquid environment allows the clothes to be seen clearly as they float weightless through the space. A simple system of suspended stainless steel rods on sliding tracks allows the display to be easily reconfigured in minutes. 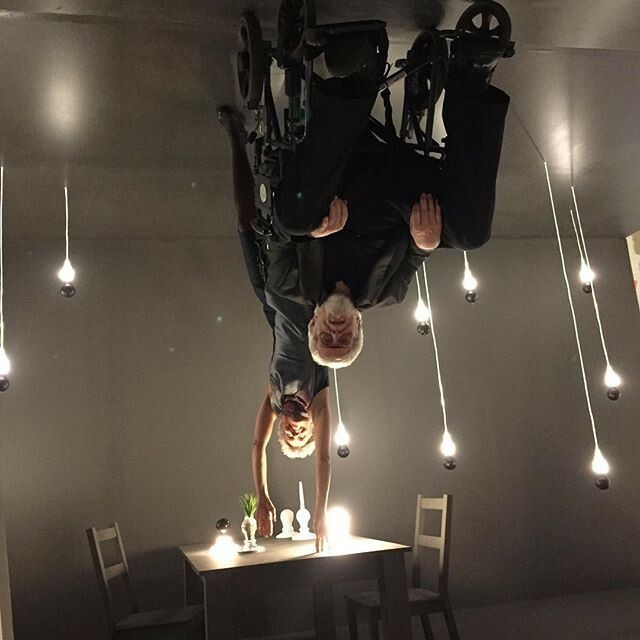 The desire for levitation was inspired by the exhilarating views of the city from the showroom's continuous band of wraparound windows high above Times Square and face to face with some of New York's greatest skyscrapers. 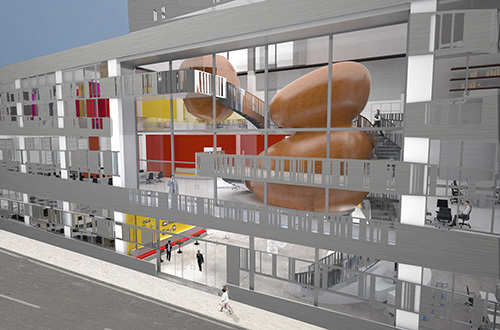 I-Beam Design's proposal transforms an 11,000 square foot raw commercial space into new offices for the independent healthcare advertising agency, Concentric Pharma Advertising. The space is located on the edge of SoHo in Lower Manhattan in a former industrial building with impressive cast in place mushroom column capitals. The proposed design maintains much of the charm and character of the existing space while adding distinctive architectural elements that warm up the space while satisfying the programmatic requirements given by the client in a compelling and seductive way. A large egg-shaped conference room separates the reception area from the main workstation zone and serves as a focal point within the space. The unusual shape of the executive conference room is evocative of a giant capsule, pill or futuristic health spa and its surface is perforated by chemistry flasks that create unusual windows into and from the room while allowing natural light to penetrate the "egg". The room is lit by custom designed Chemical Light Fixtures that are suspended over the conference table. The remainder of the space provides 3 executive offices, 22 semi-private offices and 46 workstations. The kitchen and lounge area allow the staff to interact with one another in a casual but elegant environment. Custom-made workstations are separated by glass and gypsum wall board partitions and all perimeter offices are enclosed by translucent sliding glass doors allowing natural light into the workstation zone. The spatial concept provides Concentric with ample opportunities to display their seductive graphics and imagery of pharmaceutical and health products as an integral part of the overall office architecture. 10,000 SF of offices, showroom and storage. 30,000 sf of offices, trading area, conference rooms, lounge and reception.